It was a case of another month, another record for the BBC's hugely popular iPlayer, with the video on demand service topping 120 million requests in January. 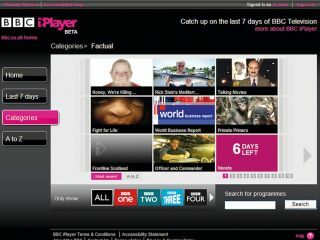 The iPlayer has been a massive hit for the BBC, helping bring the concept of content over IP to the masses. And it appears that the success is showing now sign of stopping, with the first month of 2010 bringing an ever bigger audience- quite possibly boosted by people seeking out those Christmas specials that they slept through first time round and dodging the cold weather. The first week of the new decade was the most popular, with 23.8 million requests and more than two thirds of all requests in the month for television, with the remainder seeking radio. As you probably guessed, Top Gear picked up top spot with Dr Who and Gavin and Stacey beaten into second and third respectively. The figures bring a timely boost for Project Canvas, which the BBC Trust has provisionally green-lighted – showing that the desire for video on demand is growing. Canvas' goal is to bring video on demand through the internet to the television, and despite opposition from major manufacturers and the likes of Sky, it seems likely that the first Canvas set top boxes will appear within the next 12 months.